The cornea is a clear, dome-shaped surface that covers the front of the eye. Corneal tattooing has been used as a regulated surgical treatment for disfiguring corneal scars or to treat glare due iris trauma. This treatment is performed by an ophthalmologist in a sterile operating room with tested dyes that have been studied in the ophthalmic literature for decades. A growing concern for ophthalmologists is the increasing number of patients experiencing blindness and ocular trauma as a result of eyeball tattooing for cosmetic purposes. The risky act of tattooing an eye is being performed by untrained individuals who have no knowledge of the eye’s delicate anatomy. 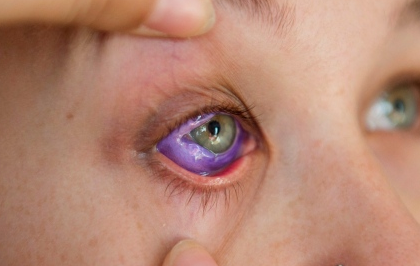 They are injecting an unregulated coloured dye at the conjunctival-scleral surface which can and has resulted in chronic ocular inflammation and migration of the unregulated dyes in to the eye causing potential toxicity to the retina. Ocular tattooing by untrained professionals has also resulted in numerous severe ocular complications via needlestick penetration of the sclera (eye wall) causing cataracts, retinal detachments and choroidal hemorrhages of the eye. Many of these eyes have developed untreatable infections (endophthalmitis) that has led to the removal of the eye (enucleation) due to severe pain and potential spread of the infection to the eye socket and brain. Other short-term complications reported so far include: headaches, severe photophobia, persistent foreign body sensation, and migration of ink staining. As mentioned, more serious short-term risks include infection (endophthalmitis), globe penetration, retinal detachment and peri-ocular haemorrhage. Speculation on the long-term consequences include retinal toxicity or granulomatous ocular inflammation. Unfortunately, the long-term risks of cancer are not known with these unregulated tattoo inks and dyes. In September 2017, a 24-year-old Ottawa woman went to a tattoo artist to get her sclera tattooed. The process performed on the woman involved using a needle to inject an unregulated dye under the bulbar conjunctiva of the eye. The tattoo procedure did not go as planned. She immediately experienced intense pain and is at risk of suffering long term ocular complications. The Ottawa case went viral around the world as this tattoo artist stated he has done 20 eye tattoos with multiple complications in recent months. This is not the first case in Canada. A 24-year-old Alberta man had his eye surgically removed as a result of bacteria contaminated tattoo ink which was injected into the eye. When learning of the Ottawa tattoo tragedy, the Eye Physicians and Surgeons of Ontario (EPSO) decided to take action. A letter was sent to Minister Hoskins and a meeting was scheduled for October 31st with MPP Soo Wong who has experience working in ophthalmology as a nurse, and senior advisors from the Ministry of Health and Long Term Care (MOHLTC). EPSO also met with NDP Health Critic France Gelinas and PC Health Critic Jeff Yurek. 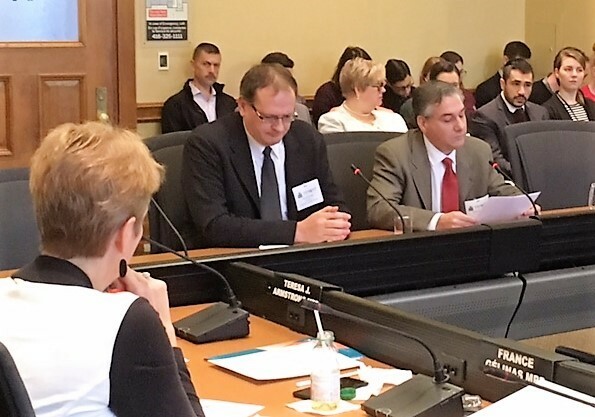 On November 16, 2017 EPSO’s Chair and Past Chair, Doctors Jordan Cheskes and Kylen McReelis, returned to Queen’s Park as witnesses and presented to the Standing Committee on General Government requesting that Bill 160, Strengthening Quality and Accountability for Patients Act, 2017, be amended to prohibit anyone from injecting the eyeball for the purpose of cosmetic tattoos, or implanting a foreign object under the conjunctiva for the purpose of eye jewellery. EPSO’s message was well received and in December 2017, the amendment to Bill 160 which included a ban on tattooing the eye or implanting jewellry under the conjunctiva, received royal assent by the Lieutenant Governor. EPSO is thankful for the collaboration demonstrated by all political parties. Clearly this is legislation that is important to protect the vision health of Ontario residents.